2 days down and 4 more to go before Chris gets home. We have been having a good time and are doing well. 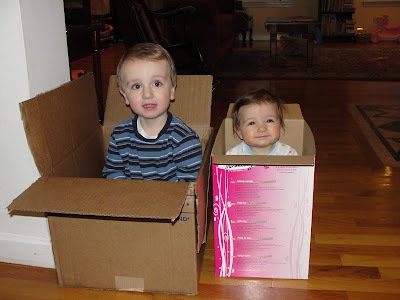 But we miss Daddy so here are some pictures for him. Today we are going to have a lazy day. Make some banana bread and watch the Mighty Ducks 2. Perfect movie for a hockey obsessed 3 year old! And it gives me a few minutes to myself. Chris is in Colorado for work (and some skiing) so we are just a family of 3 this week. To keep us company we had lots of friends over. Kelley came over early this morning to watch the kids so I could go to my Bootcamp class. It was great for the boys to get to play. When I got back Lucie, Sona and Lisa were there. The kids played and we had lunch until it was time for naps. Lisa stayed for the rest of the day and helped me entertain the kids. She played some hockey and read lots of books. The best part was our dance party. Lisa was finding some good music on her phone, but this was the song Richie requested. I guess Laila at school sings it all the time. Too funny! Angela said her first words!! Although I think all kids start off with the same first "word", we had to capture it. 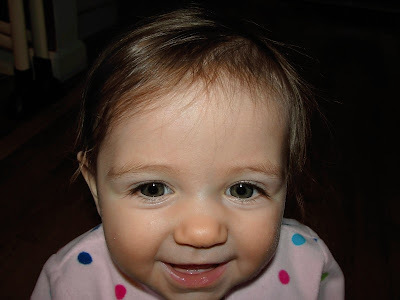 For about 2 days now she has been yelling DADA all around the house. It melts Chris's heart! I have just been having her practice MAMA. She has really found her "voice"...... meaning she can really yell. We found this restaurant called Full Moon in Cambridge that has delicious high end adult food AND kiddie food. The best part is that they have a play space that you can see from your table for the kids to play while you dine. We invited the Revette's so we could sip some wine/beer while Richie and Lucie played. 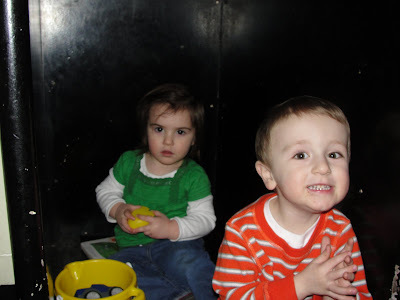 At one point Ben couldn't find the kids....they were hiding in this cabinet so I had to take a picture. We have been lucky enough to spend a lot of time with our buddy Lucie. And we are excited because Lucie is going to be a big sister in August! Angela has a tooth...well actually 2 teeth are making their way in. It seems like we have waited a long time for them because she isn't that into baby food. I have had to get creative with soft and mushy yet not puree options. And I was actually able to get a pretty good pic of them! These teeth have brought on this terrible habit of spitting. 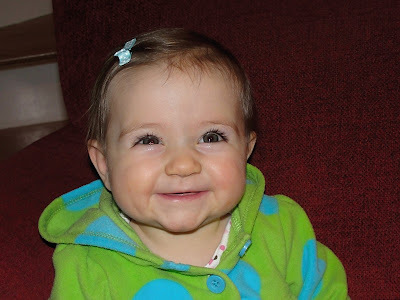 Her and her brother think it is the funniest thing. So we are reprimanding Richie for laughing and trying to teach an 8 month old that spitting isn't nice. Good luck to us. In the mean tine, Chris got hit with a Cheerio at the dinner table last night.......ah, kids! Still not rolling over or crawling, but that is how my kids do it! Richie rolled over, but never crawled. 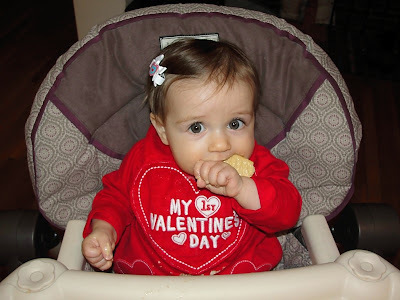 This weekend brought Angela's first Valentine's Day and Angela's first "cookie"! 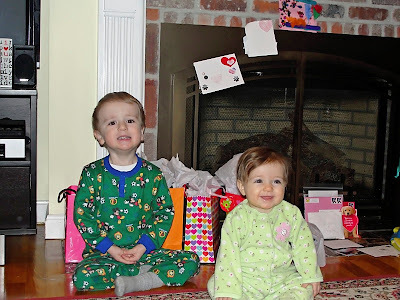 We had a great long weekend of fun things for Valentine's Day. On Saturday I got to spend the day with my little man. First we went to our school friend Jackson's house for a play date. Jackson's last name is LOVE so it was very appropriate. That afternoon we went to see Disney on Ice with Richie's girlfriend Maddie and her cousin Haley. Also very appropriate and VERY fun (thanks Kelley and Zach for the great tickets!). I wish I could say Richie was my Valentine, but he made it very clear that I couldn't be because Angela was his Valentine! Could he get any sweeter??? He said Daddy was my Valentine. OK, I will take it. On Valentine's morning we hung up all of the decorations and cards we had made and received. Then we pretty quickly went to opening presents! Breakfast was heart shaped pancakes and dinner was special dinner with Aunt Erin. 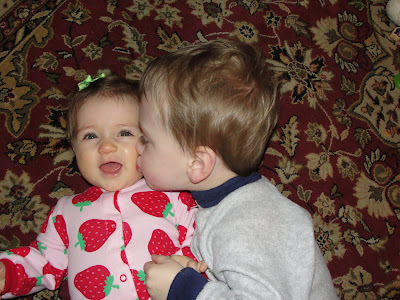 Happy Valentine's Day and our love to all! 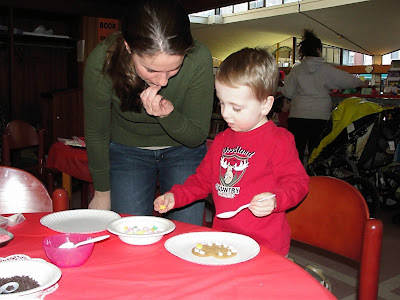 Our next Valentine party was at the library. As part of my Friends of the North End Branch library group, I helped put on this event. Miss Jennifer did a great job having the kids make Valentine cards and decorate heart shaped cookies. As you can see the kids had a blast and the event was a huge hit. Dawn came to help at the library and stayed to watch the kids so Chris and I could go out for our Valentine date. It was dinner and a movie and it is always so nice to get out for a while. Adult time is a must and always appreciated by us! 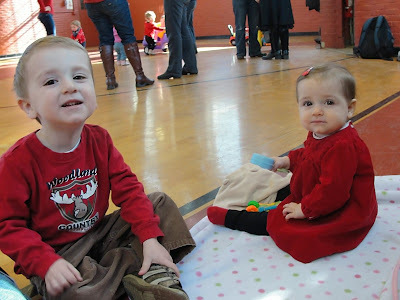 Our Friday morning play group had a Valentine party this week. It was so exciting to see all of our little neighborhood friends, make cards and have special treats! This was just the start of a long weekend of celebrating. I never really even knew Valentine's Day was such a holiday. 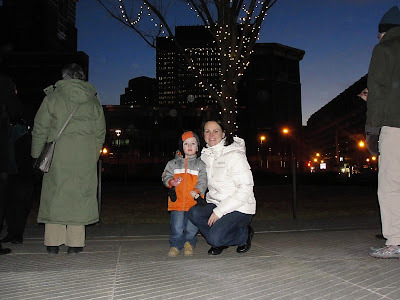 The Rose Kennedy Greenway Conservatory had a tree lighting of the great elm tree on our corner of the park. The elm is the largest tree on the entire Greenway and the lighting was part of the "Bright Lights for Winter Nights" campaign. It was so nice to have this so close to our house and at our favorite park. We braved the cold for this great event with lots of good food, music and treats. Since the Super Bowl falls on a Sunday night and we had no interest in going out. Instead we had our own party! 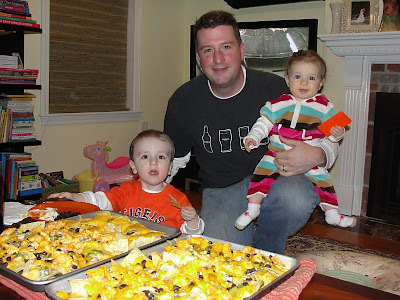 We made nachos and got to eat them in front of the TV. Richie isn't as interested in football as he is in other sports, but he seemed to enjoy the whole idea of special TV time. We can't wait for the Olympics! My little peanut is 8 months old and not a little peanut any more. Aside from acting like such a big girl she is now also not so small. She weighed in at 14 lbs 13 ozs and 26 1/4 ins. The doctor is very happy with her progress and not at all concerned any more with her size. Keep eating my moosey girl! Richie at 8 months - and still going strong with that svelte figure!